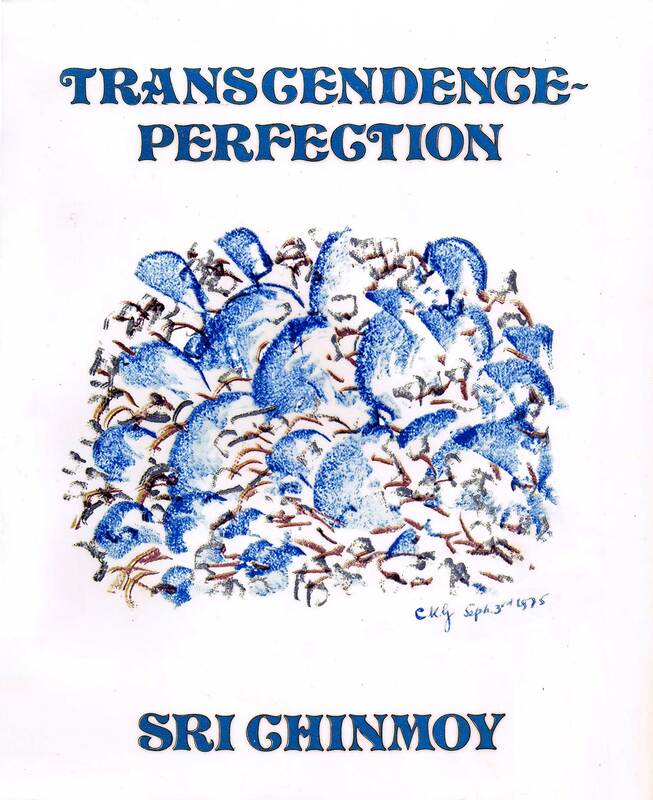 On November 1st, 1975 Sri Chinmoy established a poetry record by writing 843 poems within 24 hours – and 1 day later a book with all poems was published entitled “Transcendence-Perfection”. This is the cover of the original edition. The poems can also be read online on srichinmoylibrary.com. Now one student of Sri Chinmoy, Mahiruha, learned all these poems by heart, congratulations! 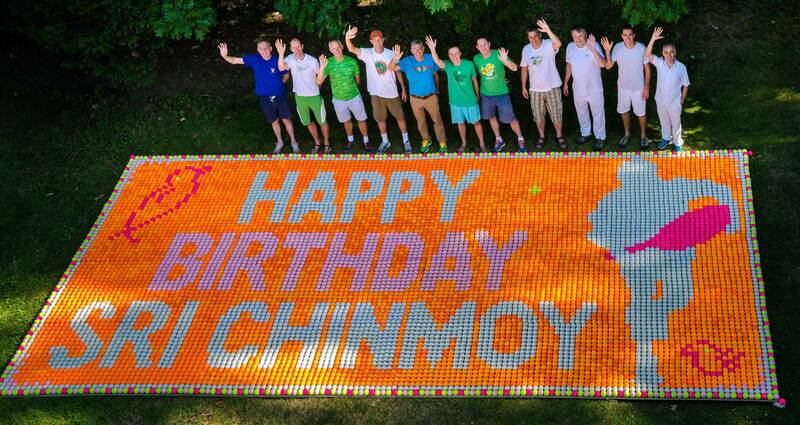 To honor Sri Chinmoy’s 84th Anniversary Ashrita Furman and his crew created the largest picture consisting of tennis balls of various colors. Today students of Sri Chinmoy celebrate the anniversary with many festivities world-wide, the biggest being the celebration in Queens, New York. A giant record-breaking mosaic consisting of over 10,000 tennis balls has been created here to commemorate the 84th birth anniversary of Indian spiritual leader Chinmoy Kumar Ghose. City-based Ashrita Furman, who holds the most Guinness Records at the same time (currently 195), worked with 20 friends to create the world’s largest tennis ball mosaic. 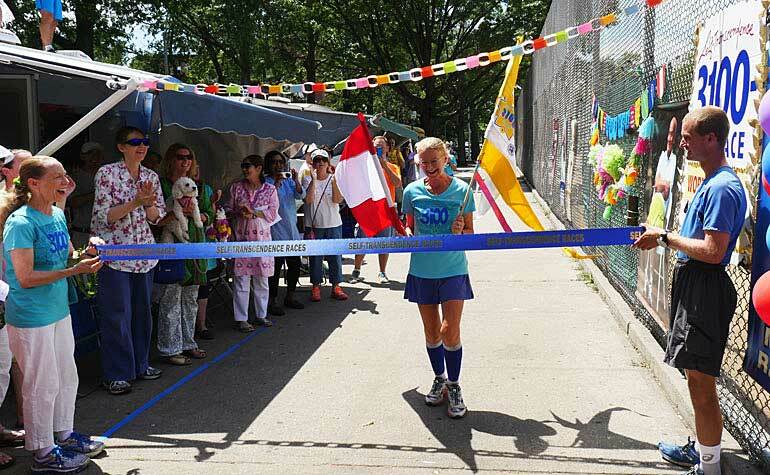 With the creation, the 60-year-old health food store manager set the Guinness World Record for the world’s largest tennis ball mosaic in honour of the meditation teacher Sri Chinmoy. 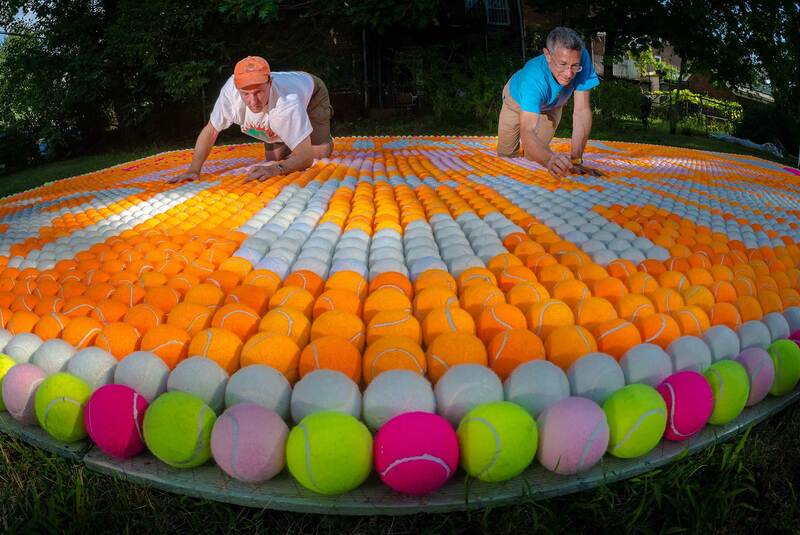 The mosaic consists of 10,084 tennis balls in white, green-yellow, orange and pink fixed on boards. The ball composition shows a tennis player in action and has a length of 29 feet and 9.5 inches and a width of 15 feet and 4 inches. Furman surpassed the previous record of a 2,732 tennis balls mosaic, which was created by Tennis Emirates in Dubai a year ago. Furman credited Chinmoy for inspiring him and the world to “find more joy and peace in our hearts”. Given that the spiritual leader was an avid tennis player, Furman said he came up with the idea to create the tennis ball mosaic. Furman has been breaking Guinness World Records since 1979, including building the world’s largest tennis racket. A special concert will take place this Saturday night, August 29th in NYC (7:30 pm at Baruch Performing Arts Center). World -famous musician L. Subramaniam, recognized for decades as India’s foremost violin Maestro, will be performing in Sri Chinmoy’s honour. He had considered L. Subramaniam to be India’s finest violinist and spiritually soulful beyond compare. 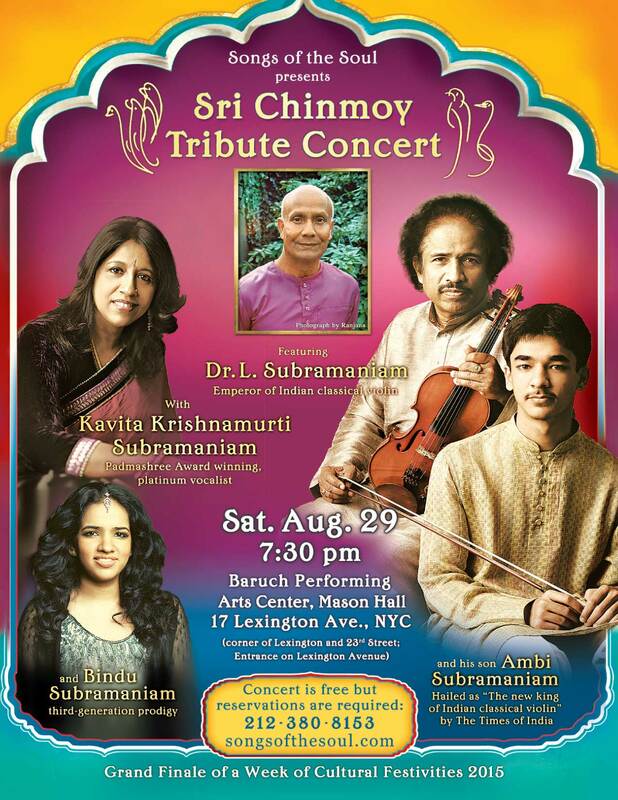 L. Subramaniam has rearranged his very busy schedule to come to New York and play as the grand finale to the celebration of Sri Chinmoy’s 84th anniversary. He will be joined by his wife Kavita Krishnamurti Subramaniam, a Padmashree award-winning “melody queen”; son Ambi Subramaniam, dubbed “the new king of Indian classical violin” by the Times of India; and daughter Bindu Subramaniam with her haunting and hypnotic voice. Meditation – Key to managing stress? Is meditation the answer to our modern woes? 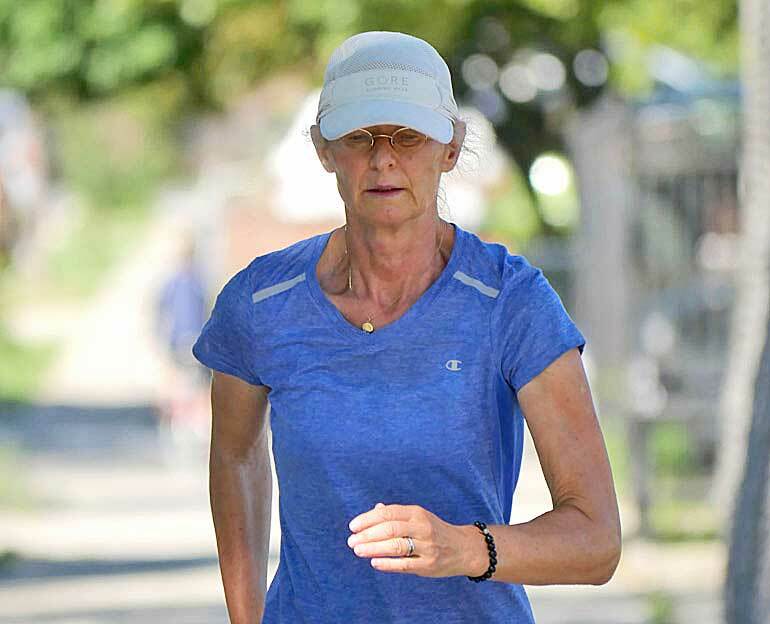 One man – author, practitioner and operator at Auckland’s Sri Chinmoy centre, Jogyata Dallas – believes so, and the thousands of people he offers free meditation classes to each year would agree. “Meditation is certainly becoming increasingly popular,” he explains, “in part because of the growing clutter and stress of our outer lives, but also because of a quiet incoming shift of consciousness in humanity as a whole.” Jogyata says his late meditation teacher Sri Chinmoy asked his students to offer free courses in meditation in the belief that inner peace is everyone’s birthright and that meditation is a very powerful life skill that keeps balance and clarity in our lives. “We teach about 1000 people a year how to meditate,” he adds.